Mother's Day 2018 - "Life Doesn't Come with a Manual, it Comes with a Mother"
Join us for our Mother's Day Service 2018 at the TOP. 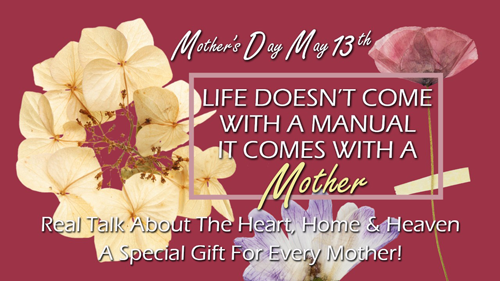 This year's theme is "Life Doesn't Come with a Manual, it Comes With a Mother." The service will feature a three member panel: Bishop Huntley's wife Patsy Huntley, Senior Pastor's Wife Christy Ballestero, and Senior Pastor's daughter Christyana Ballestero. Service begins at 10:30 AM on Sunday the 13th. There will be no PM service on that Sunday. The Temple of Pentecost is an Apostolic Church, affiliated with the United Pentecostal Church International - a Oneness Pentecostal organization.